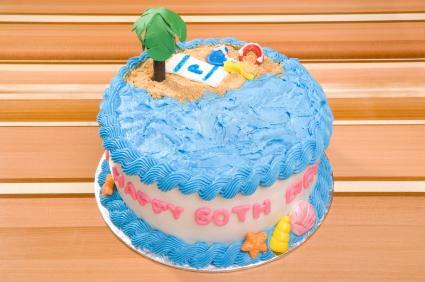 Make someone's birthday truly a "day at the beach" by using the sun and sand as inspirations for her cake. Whether you go with a simple buttercream design, an airbrushed masterpiece, or utilize a shaped cake pan, these themed birthday cakes are sure to bring a smile as bright as sunshine to the celebrant's face. Plenty of options are out there for beach birthday cake designs. Choose one that fits with your decorating skill level and it's sure to be a success. You don't need to be a professional to create a cake that brings all the guests out of the water. Buttercream icing makes creating a simple beach scene easy. Follow these steps to recreate a simple beach scene on a two layer round, square, or rectangular cake. Bake the cake and allow it to cool. Fill, if desired, and add a crumb coat of buttercream frosting. Frost the sides of the cake using white crusting buttercream frosting, smoothing the sides as you go. Frost the top of the cake using blue buttercream icing, leaving about one quarter of the cake open to create a beach scene. Frost that area in a sandy brown buttercream. Before the blue frosting sets, use an angled spatula to create "waves." Pull the spatula through the frosting using a wave-like motion with your hand. It's fine to leave the edges sticking up, as this gives it a realistic feel. Pat light brown sugar or raw sugar over the brown buttercream to represent sand. Use the blue icing to make a border around the top and bottom edges of the cake. A rope border would work well for both edges; alternatively, consider making a small c-motion border along the bottom edge to represent waves. After you finish creating the beach scene, add your accessories. Purchase beach cake decorations, like mini umbrellas, online or at a craft supply store, or make them yourself using fondant. Don't forget to add a birthday message around the sides of the cake. Decorators who are familiar with airbrush techniques can utilize their skills when making a beach cake. The finish of this cake looks good enough to be framed. Bake and cool cake, fill if desired, and cut into a triangle. Reserve some leftover pieces for later use. Crumb coat the cake with buttercream icing. Cover the cake using rolled fondant. 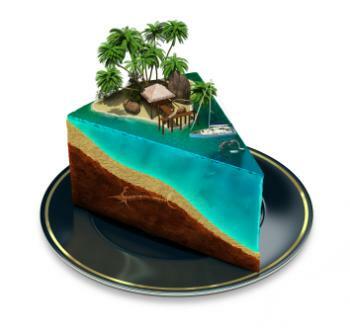 Use your airbrush to create a beach scene on the cake slice itself. Use varying shades of blue to make the entire cake look like water. Skilled airbrush artists can make a shoreline scene as depicted in the photo to the right. While the airbrushing dries, make the island to add to the cake. Crumble up some of the reserved cake scraps and mix with a small amount of buttercream icing. Roll into a distorted ball and then flatten the bottom to create an "island" to go on the top of the cake. Lightly pat brown sugar on the island piece and affix to the top of the airbrushed cake using a dab of buttercream icing. Once your basic cake is done, you can add beach accessories to your island, such as ships floating in the water, palm trees, an "S.O.S." message, shells, or even a small person sitting on the island. These can be fondant or gum paste figures or you can purchase plastic ones from cake supply shops online. Novice decorators can create a sandcastle cake for a birthday by using one of the popular shaped pans available from bake ware companies. 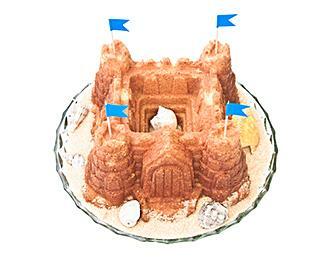 Two to consider are Nordic Ware's Castle Bundt Pan and Wilton's Enchanted Castle Pan. The cake will come out of the pans looking like a castle, without any special cutting skills necessary. Crumb coat the cakes with a sandy brown buttercream frosting. Sprinkle brown sugar or raw sugar over the buttercream. Add a few small accessories like toothpick flags to turrets, and enhance with piped buttercream frosting where desired. Consider skipping the frosting and sugar and making a spice cake or other flavored cake that has a "sandy" texture or look to it. Write a birthday message on the drawbridge door or on the cake board itself. A beach birthday cake doesn't actually have to feature the beach itself. Shaped cakes, like seashells or flip flops, are also excellent choices. Pick flavors that suggest the beach. A coconut frosting or pineapple filling are excellent choices for a beach theme cake. Brown sugar works best to represent sand, but you can also use finely crushed graham crackers in a pinch. Summer fruit cakes, while not overtly "beachy" in their nature, are also good choices for a birthday party with a beach theme. A birthday isn't complete without a cake, and a beach theme is a great way to bring home the sun and the sand no matter what the temperature is outside. Whether you choose to go with a basic buttercream scene, a complicated airbrush design, or you use a shaped pan to make it quick and easy, this is one themed birthday cake that is sure to be the hit of any party.